CWG 2018: India finish with 66 medals: 26 golds, 20 silver and 20 bronze. They are third in the standings behind Australia and England. CWG 2018: India finished with 66 medals: 26 golds, 20 silver and 20 bronze. They are third in the standings behind Australia and England. 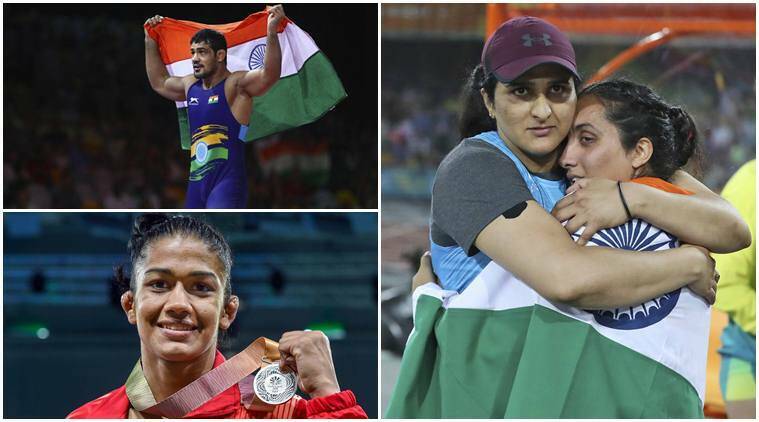 CWG 2018 Medal Tally: India breached their Glasgow Games medal haul on the last day of the 21st Commonwealth Games with few but key sports on the line on Day 11. Manika Batra continued her rich form to win the mixed doubles bronze medal alongside Sathiyan G. Also from table tennis, Achanta Sharath Kamal won bronze in men’s singles. On the badminton courts, Saina Nehwal beat compatriot PV Sindhu to claim gold in an all-India final. Later, Kidambi Srikanth went down to Lee Chong Wei and Chirag Shetty/Satwink Rankireddy lost in the men’s doubles final to make do with the silver medal. In squash, Dipika Pallikal and Joshna Chinappa were made to content with the silver medal. For India, third joint-most medals at the Commonwealth Games have come from weightlifting. Weightlifters won nine medals overall — six by men and three by women. P Gururaja opened India’s medal campaign at the Games before Mirabai Chanu became the first gold medallist. Later, Sanjita Chanu, Sathish Sivalingam, Venkat Rahul Ragala, Punam Yadav, Pardeep Singh, Deepak Lather and Vikas Thakur added to the list. Boxers won an equal number in the end. But it is shooting that has seen India shine and collect the most medals with 16 medals won. The second best showing for India at Commonwealth Games has been in wrestling. Indian teams won gold in mixed-team badminton while the table tennis teams – men and women – also created history with gold medals each to fatten India’s haul in the medal tally.